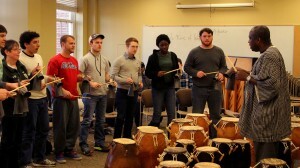 The Ole Miss African Dance and Drum Ensemble will perform a spring concert April 12. OXFORD, Miss. – The University of Mississippi Department of Music has acquired several instruments from the African nation of Ghana to further educate students about world music cultures and to use for public performances. The first of those concerts with the newly acquired instruments is set for 7:30 p.m. April 12 in Nutt Auditorium. The Spring Concert will be performed by the Ole Miss African Drum and Dance Ensemble, with additional performers selected from world music classes. The event is general admission and tickets are $10. Students can purchase tickets for eight dollars and the cost is five dollars for children. The department added 10 medium-size drums, 10 small drums and four small stick-played drums, 10 rattles and 10 double bells to its existing collection of drums from Ghana. Most of the instruments can be played by hand or by stick, depending on the particular dance students are learning to perform. The music department first acquired instruments from Ghana in 2003. This led to the formation of the OMADDE, which includes faculty, students, alumni and members of the community. In 2009, the department acquired additional instruments. However, Dor wanted to maximize learning within a limited time span during his semester-long African Music Ensemble course, which led to the most recent acquisition. African drumming and dance became an official way for students to earn credit as part of the African Music Ensemble course, but Dor said many students continue to use what they learn and become part of the OMADDE, without the aim of earning credits. “The fact remains that offering students the opportunity to learn to play these drums and its accompanying dances in an ensemble is the foremost reason for the acquisition,” he said.